Venice is simply amazing. 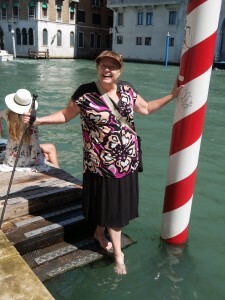 We got a waterbus at the airport and had a grand tour of the many islands of Venice, as we made our way to St. Zaccharia’s square, near where our hotel was located. Pulling our wheeled suitcases [that are big enough for a moderate sized human], we crossed on 2 arched pedestrian bridges to the tiny alley we needed. When I say tiny, I mean we could have stretched out our arms and touched the buildings looming on either side. Following written directions from the hotel, we then turned left into a really tiny alley, which gave onto a tiny alcove, in which were set up several outdoor dining sets and umbrellas. There were 3 doors, none labeled. However, the desk clerk saw us and buzzed the door open. The Ca’ dei Doge [it means “the Doge’s House” NOT the Dog House] has an absolutely charming tiny lobby, with steps leading up to our room; the restaurant led off the lobby, where we had a lavish breakfast each morning. Our room had a balcony, large French windows leading to it, and a Jacuzzi tub in the bathroom. Pronounce the zz as you would for pizza. There are no cars in Venice. There are limestone streets of varying widths, but no logic whatsoever. Foot traffic is daunting, especially if you walk with a cane. People are so busy taking selfies everywhere that you can’t use the handrails on the bridges. The charm is palpable, but so many frantic people!! Goods are moved through the streets on large hand-carts, fitted with bicycle bells and courteous men saying "coming through" in polite Italian. We had planned to take a gondola ride, but they are literally bow-to-stern as they go. There are no little by-ways to escape to—water traffic everywhere. 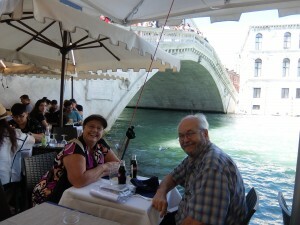 We used the water busses a lot [expensive], took one tour of the Grand Canal in a water taxi [I had to crawl off the boat as I couldn’t negotiate the bobbing at the dock]. I am so very glad that we went there, but I would never want to go back. Well, I wouldn’t want to go back and walk anywhere. In fact, I would go back in a heartbeat. In our 3 days in Venice, we did 2 major museums: the Academy Galleria [featuring a marvelous array of early Medieval art] and Museo Correr, housed in a palace purpose-built by Napoleon, right on St. Mark’s Square. The outstanding piece here was a 6-part wood block set, made in 1500, for a bird’s eye view of Venice. They had one of the original prints as well. This was so stunning, that Ron and I were the only ones to look at it. Everyone else walked through the room on their phones. 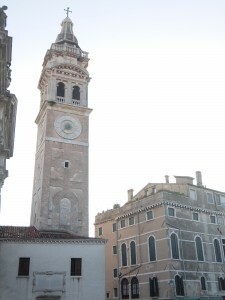 St. Mark’s Cathedral is enormous and sits next to the Doge’s Palace. The square is composed of 4 storey buildings, with arched covered sidewalks [like cloisters] framing expensive shops, with Napoleon’s palace and Correr museum above. 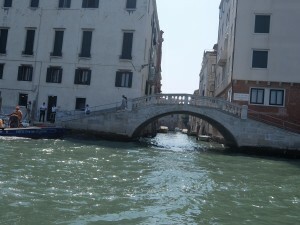 You see this in every movie which is set in Venice. I had wanted to visit St. Mark’s Cathedral because the actual body of the apostle was there. He had originally been buried in Egypt, but the Venetians hated him to be in the land of the Muslims, so they stole the body in 828 AD, hiding it in pork so the inspectors would not search their cargo. But, as we were deciding whether the long wait to get in was worth it, I read in the guidebook that the body had been burned in the fire of 922 AD. When they rebuilt the church, they miraculously “found” Mark’s ashes. I snorted at this concept, but Ron said, “All they had to do was sniff around for the smell of pork rinds.” Still, there were so many people waiting to get in to the Doge’s Palace and St. Marks that we decided it was not worth the wait. Pork rinds notwithstanding. 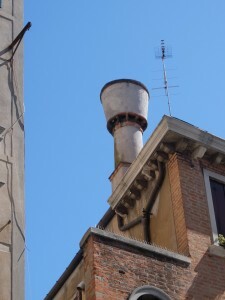 Unique chimneys in Venice: since there is low pressure everyday, the chimneys are engineered to draw the smoke anyway. In addition to museums, we had an agenda of steeple-chasing. Literally. There are more churches in Venice that in Newport News! Many have fine art. There is no rhyme or reason to what they charge for entry; so we decided based on what we knew was inside. The Basilica of Santa Maria Gloriosa dei Frari was arguably the best and a bargain at €3. “The Assumption [of the Virgin]” by Titian is an enormous and gorgeous work, and the numerous chapels within the basilica were all rich in art. Massive fish die-off in Venice lagoon! We took many pictures and the waiter took ours, all the while the foaming crowds were breaking like waves over the walkways. We watched as a man on the cell phone gestured wildly with his free hand to make a point. We listened as the bells of the churches rang the changes [this means actual human ringers] with no perceptible reason or timing. 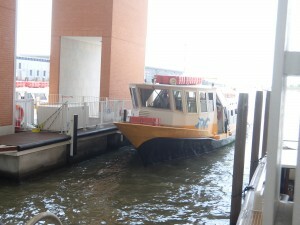 We admired the gondolas gliding by, and even the water taxis, making little noise. We explained to the ducks that we would not share our food. We were impressed that the notoriously stinky canals have been cleaned up despite rain run-off from the streets and gasoline from all the boats. And we regretted sleeping with our balcony doors open because, despite the screening, we were eaten alive by mosquitos. Fortified by our rest, we slogged around for a few more hours, shopping and chasing steeples. The shopping is of high quality and varied price. Venice is known for hand-printed paper, glass and Carnival masks. We bought some of each. Venice is unique. It is no wonder that czars and emperors have wanted to create “a Venice” in Amsterdam, Netherlands; in St. Petersburg, Russia; even Venice, CA. But none of these is really anything like Venice. The sea sweeps in twice a day to flush out the canals; not a large tidal surge, but enough to clean things. There are no cars, Vespas or bicycles as there is simply nowhere for them to go. Real estate is almost as pricey as Monaco so that most who are born in Venice leave to find a better life. FYI, only 55,000 live there full-time. But Venice, from its beginnings was a city-state of free men who governed themselves and thrived by capitalism, albeit with a taste for conquest thrown in. Venice is unique. August is a miserable time to go cruising the Mediterranean. We had been misled about temperatures in Italy; Ron spent a lot of time online looking at daily temps, but perhaps what he was given were averages or outright lies. So we packed too many warm clothes, but, since we believe in layering, it only meant that we didn’t wear a lot of what we brought. Still, we brought home our swimsuits unused, preferring to be in the air conditioning of our cabin. We flew British Airways to London and on to Venice. I will never willingly fly the old BA again. They have crushed the cheap seats down to absurd dimensions. I laughed out loud when the showed how to put your head on your knees for crash position. There was simply not enough room from the seat ahead to assume this position. Fortunately, we didn’t crash.